Last spring I had an idea for a new challenge for myself. My plan was to paint small, primarily in oil, and to post the paintings on the DailyPaintworks auction at extremely low starting prices to get them out of my studio. I called it my SUPER SUMMER SALE. There were 14 paintings posted over a 6 week period. This project was fun to do and the paintings all have new homes. A side benefit was what I learned about selling through an auction in today's market - I'll share my thoughts on that in a future post. In mid-summer I created another challenge for myself, once again thinking of it as a way to keep myself entertained in the studio but after reading Big Magic by Elizabeth Gilbert, I now understand that what I am really doing with these frequent challenges is tricking myself. Tricking myself into making art. I highly recommend listening to the audiobook read by the author. In 2014 I worked in oil on small still life paintings. When I returned to oil this summer I warmed up with the summer sale to then move on to painting larger - but what subject? Maybe interiors? I started off in that direction. Then, the idea came to me that it would be interesting (to me) to see how I would now interpret the same still life scenes I painted 20 years ago. 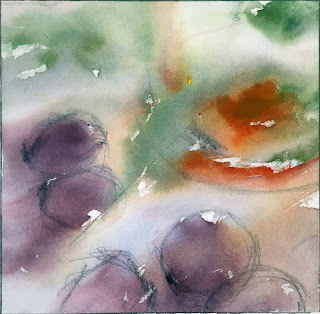 I selected three images of my old work - two colored pencil and one watercolor. Using Photoshop, I changed the format to square and printed photos to use as reference for three 18x18 inch oil paintings. 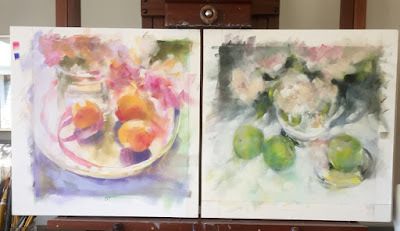 The new versions of the old paintings are complete now and I will post step by step progression photos of each on this blog. 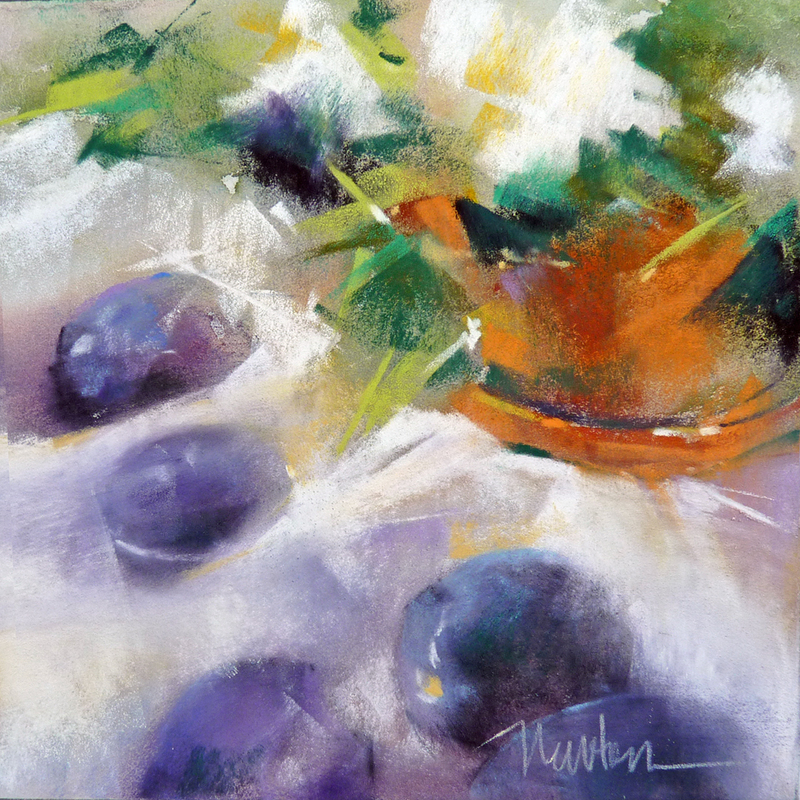 My next trick will be setting up new still life arrangements and painting even larger. What tricks do you use to get yourself to the easel? If you are old enough, I encourage you to try this challenge with your 20+ year-old work. The way we see the world changes as we age. It is interesting to me to compare the way I expressed my world through art then compared to now. Today was varnish day for "A Fine Romance," 18x18 inch oil painting on Fredrix Canvas mounted to archival foam core. I used Liquitex Soluvar Gloss and Matte mixed 50/50. Applied a generous coat with a brush that I reserve for varnish only and though the painting is dry to the touch and can go into a frame, it will cure totally over the next few months. This is the gouache underpainting on white Pastelmat. September Song 6x6 is a color study for an upcoming 18x18 inch oil painting. 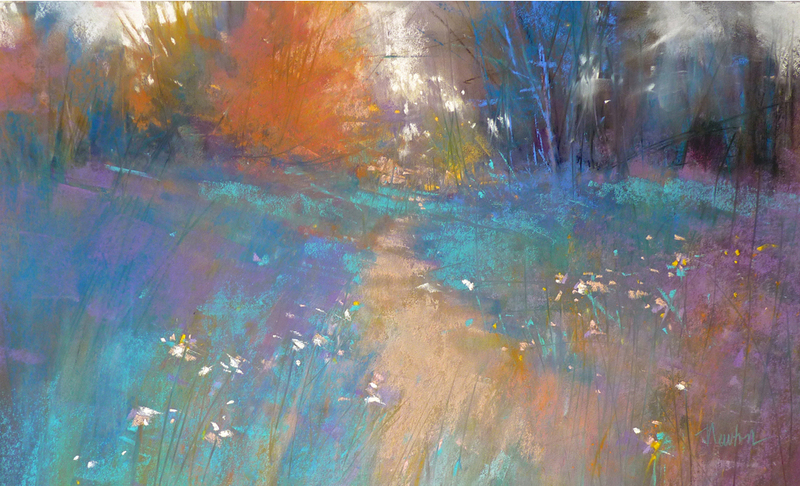 And, here is the finished pastel, available for purchase on Daily Paintworks. I just spent a couple hours organizing my thoughts and recent revelations on my Golden Years blog. Click the link below to read about Big Magic among my other thoughts. To receive the occasional post from this blog, please subscribe as I don't always put a link on this blog as I'm doing now. I received a nice surprise today when I learned that my pastel painting, "Rejoice" received the Golden Gift Certificate Award at the Women Painters of Washington exhibit currently showing at Childhood'd End Gallery, Olympia, Washington. Thank you Juror/Judge Melissa Weinman. Congratulations to all the artists in this show and also to all award winners. I don't enter many competitions these days but this one was special partly because I am honored to be a Life Member of WPW but also because my previous long-time Olympia gallery sold recently and this was a chance to show my work again in that city. "Infatuation" " A Fine Romance"
I have created a challenge for myself of four 18x18 inch still life oil paintings. There is a backstory to each of the paintings and I will blog more about that later. When working in pastel, I work very quickly to create work that is loose, not labored but this new, larger oil work is the opposite process. 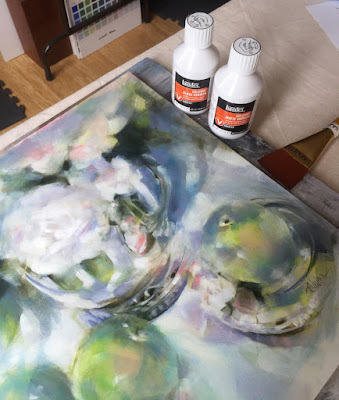 I will be working simultaneously on all four paintings to allow the paint to dry - some days I will glaze, some days I will be focused on opaque areas. Coming into the studio each morning will give me a chance to look at them with fresh eyes. Instead of working intuitively, each day I contemplate the value balance and composition because in oil I can add an object or wipe one out effortlessly. I expect and even look forward to working on the same paintings for a month or more. I love working without a deadline but I also need to continue the work daily or I will lose interest. This morning I painted for about 3 hours on the two paintings above. For me, that is the maximum number of hours at the easel before I need a break. I started "Infatuation" just last night so it still looks quite raw and lacking in nuance of color and form. 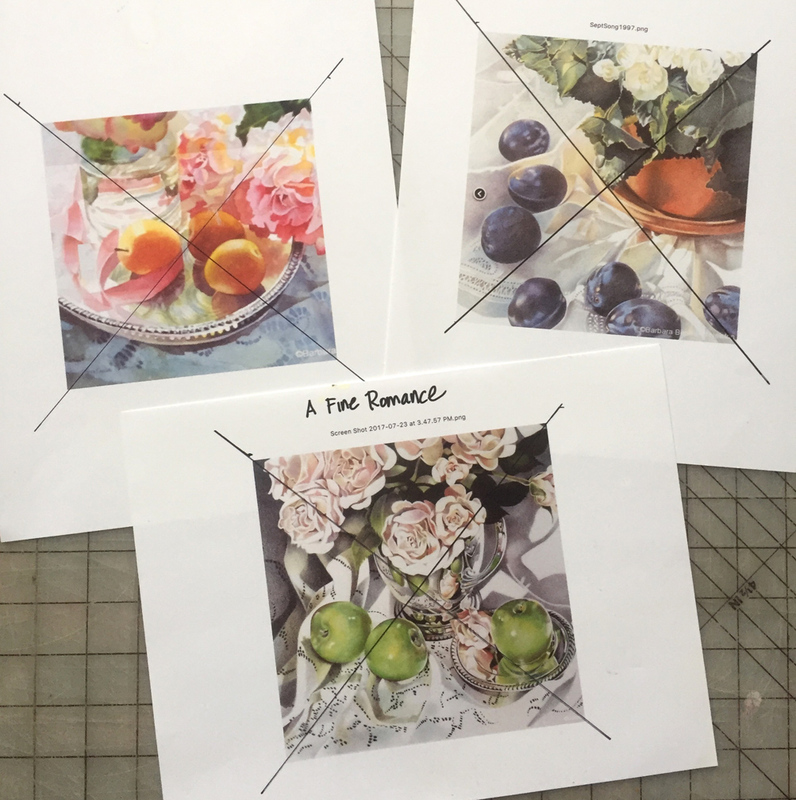 The painting on the right in the photo above, "A Fine Romance," is nearing completion. I am taking step x step photos that I may post when my project is complete.